In my new role here at Prospect North I have to provide some non-contact lessons for the classes here but the good thing is that it can be delivered flexibly and all teachers want it to be of a STEM or Digital Technologies flavour. This is good because it is an area I am pretty comfortable in and quite frankly, an expected part of my role. The school is still building up its STEM resources (another reason my role exists) and is a focus school in a partnership with Social Ventures Australia. 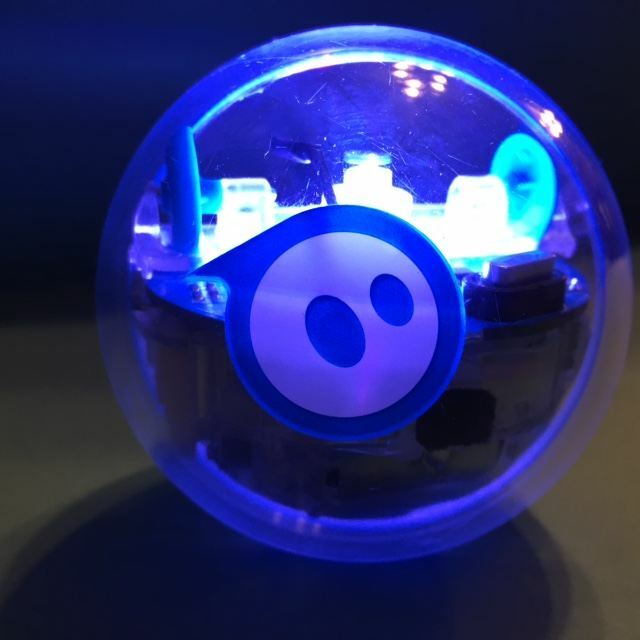 So, I have spent today planning for the upper primary classes as I will deliver 4 x 90 minute sessions spread over the next six weeks and I thought I would start with using Sphero as an introduction to coding. I have used Spheros quite a bit over the past two years and so thought I was working in familiar territory. The school had bought 24 new Sphero SPRK+ robots prior to my arrival and so on Friday I thought I had better charge them up ready for the coming week and check the iPads in the area to ensure that the apps I wanted to use were all there. Looking at the new SPRK+ my initial thought was that they were very attractive with the clear exterior of the standard SPRK model with a blue equatorial stripe. They also appeared to be the same size as the standard white Sphero as the SPRK models I had bought at WGS were slightly smaller, meaning that covers were a little loose and it spun inside the plastic chariots without moving. I hooked everything up and left them all to charge in the library for a few hours. After lunch, I checked by with my iPad to start the labelling process that I had established before and picked up the first fully charged robot I could see and went tap tap on the bench to wake it up. But ..... nothing happened. I tapped a bit harder but still no response. I assumed that maybe it hadn't charged properly so I dropped it back on the charger and tried the next one. Same result even when I dropped it directly onto the carpet. I thought that maybe the Spheros were in deep sleep mode and went through the process I thought would bring them out of that mode. No deal and nothing was being detected when I looked at Bluetooth on my iPad - something was not right here so I headed for the internet. Currently, SPRK+ is only compatible with SPRK Lightning Lab application which you can download at https://sprk.sphero.com/d, and the main Sphero app. I could feel my plans and accumulated knowledge of relevant apps crumbling into dust in my mind. I couldn't use Drive, or Draw'n'Drive, or even Tickle if I was to believe this post. I quickly rushed over to see the school technician before he wasted his time trying to find the now-outdated apps for the iPads! So I went over to my previously ignored Lightning Lab app to see how it would all work. Straight away I could see a new feature for connection that was a big improvement from the past. Simply you open up Lightning Lab and choose SPRK+ from the Tap a Robot to connect menu and I was away. No more opening up Bluetooth and looking for the three letter colour code to connect. No more accidentally bumping a Sphero and waking it up in transit and wasting valuable battery. Even better, there is now a battery life indicator on the main page. Through this app, the user can progress through a Learning to Code series of mini-lessons and activities although you need an account to access this feature. This worked fine at home but there were some issues on Friday on the school network. A workaround might be to get the kids to sign up on their own laptops and follow the lessons in a self paced self managed style that would suit quite a number of learners, as long as the website isn't filtered on there as well. Something to negotiate with the IT department but unlikely to be resolved in the short amount of time before I want to use these with my first class. Within Lightning Lab you can use joystick style controls which essentially makes the old Drive app redundant. That was good and even better was the option to code by Draw which meant I still have access to the same capability that the Draw'n'Drive app provided. I then went onto the Tickle app site and found out that they do support the SPRK+ on the latest version which sent me hurrying back to our IT support to change my order to include that as a required update. Finally to make my day, two staff members came through the library where I was starting to pack up the charged Spheros and asked if they could borrow one for the weekend. They downloaded Lightning Lab on their phones and were already buzzing with the possibilities as they had to give the Spheros a run around before heading off for the weekend. So, this is a greatly improved Sphero. After getting over the fact that its improvements had made some familiar apps and processes irrelevant, I can see that this is a more focussed_on_learning_that_is_fun product with less connection to pure entertainment which can cloud the learning potential for some students. I am looking forward to see how the students engage with these robots and perhaps show me some new possibilities with their learning. Posted in Programming, STEM on May 13, 2017 by Graham. The lightning app has since been name-updated to ‘Sphero Edu’. If you search for the lightning app and sphero, you’ll see Sphero Edu arrive at the top of the list. Thanks for that – I did write this post over a year ago so the app auto-updated to SpheroEdu a while ago. Do you label your sphero’s for the students? If so, how do you do this? I’m struggling to help larger classes get connected. This is an issue that I haven’t really resolved either. The only way I can think of is to get kids to connect to the Spheros some distance from each other so that the iPads are picking up only on the closest Sphero. I have used permanent marker on the original Sphero 2.0’s to record the Bluetooth colour sequence but the SPRK’s don’t connect that way. Maybe pose your query out to Twitter – it may get a better response. Sorry!